Gifted pianist showcases instrumental brilliance on this new release. Often, the term prodigy is applied with minimal context. 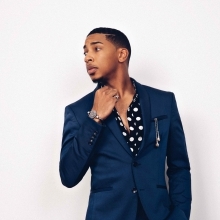 In the case of jazz pianist Christian Sands, it is appropriate. He has studied piano since the age of four and began composing at five years old. By ten, he was performing. After years of formal music education, he became a protege of Dr. Billy Taylor. Like his mentor, Sands is devoted to playing and music education. His initial break came when he sat in with Christian McBride’s big band (Inside Straight) at the Village Vanguard. He became a member of McBride’s celebrated trio and played on the Grammy-nominated 2013 release, Out Here. Additionally he has worked with Oscar Peterson, Gary Burton, Geri Allen, Randy Brecker, Terrance Blanchard, Dianne Reeves, Russell Malone and Patti Austin to name a few. His debut on Mack Records, Reach and Reach Further established Sands as an upcoming important recording talent. Not yet thirty, Sands is poised to ascend to a new level and his latest Mack Avenue release, Facing Dragons may be the vehicle to get him there. The double vinyl (also available on CD) consists of eight originals and one cover, transformed by a unique musical vision. Side A opens with a piano-based number, “Rebel Music”. It is propelled by a left hand groove that displays bop resonance. Backed by bass and drums, there are a variety of styles, surrounding hard bop. There is a Latin-infused transition with great percussion. Sands’ playing is complex. His solos are sophisticated with articulate timing and phrasing. The jam moves to a swing mode with percolating bass and fierce drumming. Sands exerts command with gritty technique, shaded with open spaces. It is multi-faceted and always compelling. “Fight For Freedom’ is reminiscent of hard bop larger ensembles. Sands lays down a nasty groove and is joined by the muscular tandem of Keyon Harrold (trumpet) and Marcus Strickland (saxophone). Both sax and trumpet get to solo. The arrangement stretches out and returns to a cooler jazz shade. Sands’ piano solo is riveting with powerful notation balanced with lyricism. He also maneuvers adroitly under the horn/sax unison lead that concludes in a wild free jazz finish. There is unrelenting energy to Sands and his music. Side B contains the sole cover, The Beatles momentous hit “Yesterday”. Sands reinvents the whimsical ballad, adopting a bluesy vamp with a pulsating funk vibe. He distills the melodic essence and translates the song into a soul jazz opus, replete with punctuated tempo and gospel flourish. After a solo by bassist Yasushi Nakamura, Sands explodes on a virtuosic solo that features dazzling speed and improvisational agility. The underlying melody invariably returns and the slower, melancholic ending exudes melancholy. Sands embraces the essence of Venezuelan polyrhythms on “Sangueo Soul”. With an underpinning of intense drumming, Sands matches the ferocity on piano. He injects a lighter jauntiness intermingling with the percussion. His extended solo incorporates gospel, funk, soul, and Latin-infused jazz. The prominent chording and sparkling notation render the listener breathless. Side C takes on a genre-bending twist. “Sunday Morning” begins as advertised, soothing gospel piano with B3 accents. Everything gets a Memphis “kick” as a groove-laden guitar joins in against a double bass fill. Then out of nowhere there is a delightful reggae transition that morphs into tight funk. There is never a singular type of interpretation. The jagged electric guitar adds a rock element. Sands’ piano has an aspirational quality. Various jazz structures and arrangements are intermingled throughout Facing Dragons. “Frankenstein” is more ensemble focused. His opening (not quite 3/4 time) piano pays homage to greats like Herbie Hancock or Chick Corea. But the swing transitions with double saxophone and trumpet solos are pure 60’s traditional jazz. His piano lines are erudite with carefully executed flourishes. Each side of this album explores different musical constructs (vinyl sequencing). Side D exudes a softer aesthetic. “Her Song” is a quartet with the guitar (Caio Afiune) exuding a gossamer radiance with echo and reverb. There is delicate cymbal work, and Sands deep, hypnotic solo is evocative ending with a nimble sustain. His version of jazz balladry is unique. “Samba De Vela” is subtle Brazilian cadence, but has a playful jaunty break. The back and forth between low-keyed and medium tempo is appealing and contemporary. The finale “Rhodes Meditation” is nothing short of stunning. The meditative flowing reverie is reflected in the glowing tonality that infuses spirituality. It is unusual to hear a solo Fender Rhodes track. 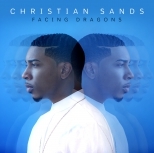 Facing Dragons is compelling jazz. Regardless of instrumental size and combination, the mic placement and overall mix result in a full, rich sound. It has resounding power and creates a musical tapestry.